Fort James is a fort in Accra, Ghana. It was built by the British as a trading post in 1673, where it joined the Dutch Fort Crêvecœur (1649), and the Danish Fort Christiansborg (1652). Fort Crèvecœur (left) and Fort James (right) in 1727. 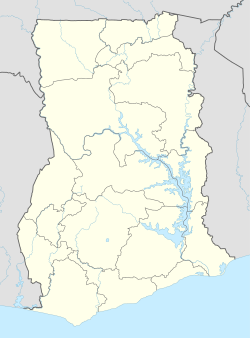 Fort James gave its name to the Jamestown neighbourhood in Accra. The fort stands next to Jamestown Lighthouse and from colonial times up to 2008 the fort served as a prison. ^ Briggs, Philip. Ghana (Sixth ed.). Bradt Travel Guides Ltd. p. 147. ISBN 9781841624785. ^ Centre, UNESCO World Heritage. "Forts and Castles, Volta, Greater Accra, Central and Western Regions". whc.unesco.org. Retrieved 2018-09-17.